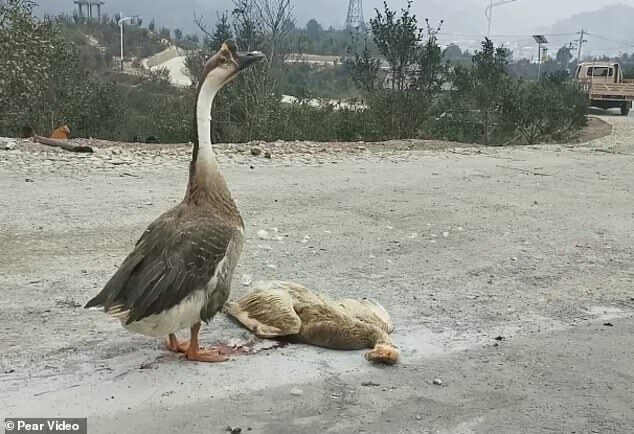 A grief-stricken male goose refused to leave the lifeless body of its dead companion after she was run over by a car in south China. 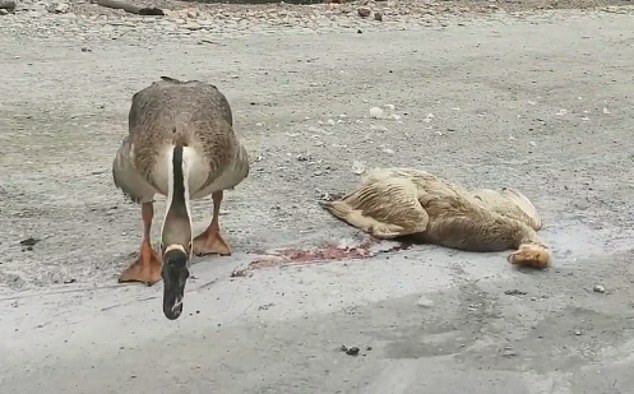 The heart-wrenching moment was caught on camera on Tuesday in a village in Longyan, Fujian province after the goose was hit along a dirt road. The male goose was filmed desperately trying to wake her up by prodding her head and lifting her neck up with his beak. 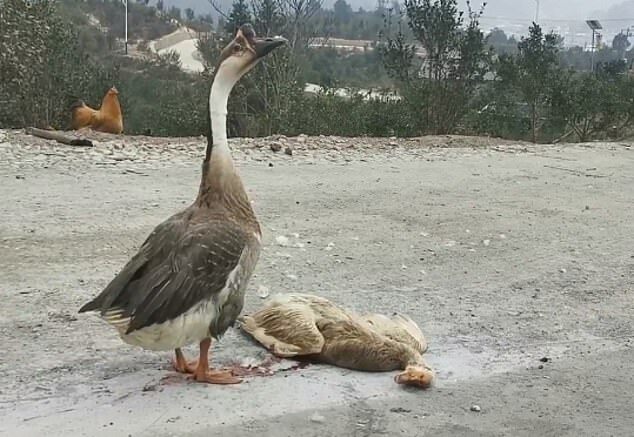 The goose belonged to a family living in the village in Changting county, according to video news site Pear. 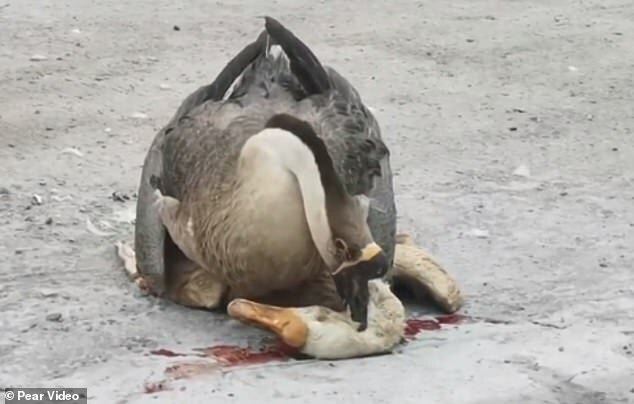 The male goose spent more than 20 minutes trying to revive his companion by honking at the motionless body of his dead partner. After sniffing and nudging her, he stood guard and watched over her before reluctantly giving up. He then walked away, hanging his head low and in despair. Net users, many of them animal lovers, were saddened by the incident. 'Sometimes animals show more devotion and commitment than humans do,' one user said on Chinese micro-blogging site Weibo. 'What a committed male goose. 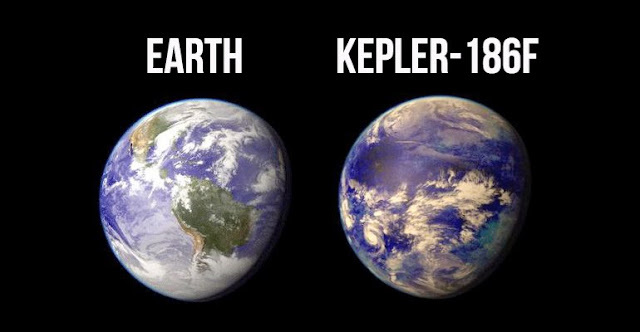 You can feel that it is devasated,' another user said. 'Please pay attention to the road when driving!' one user said.